Chicago is the largest city in the Midwestern U.S. It is the official starting point of our Route 66 adventure. We flew to Chicago from Washington this afternoon. 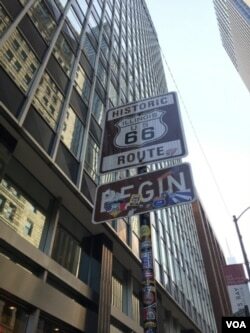 Today, we wandered around the city a bit, looking for the “official” Route 66 sign. It turned out to be just two blocks away from our hotel! After a quick lunch at Miller’s Pub, we enjoyed a walk in Millennium Park, a 10-hectare outdoor public space surrounded by many of the city’s most historic and beautiful buildings. 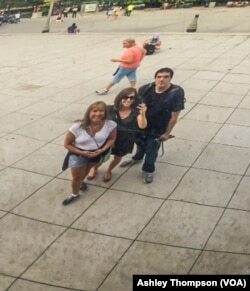 The park is also home to the Chicago Bean. 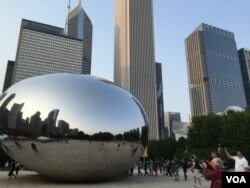 The round, shiny metal sculpture provides a mirror image of visitors and the Chicago skyline in the background. It has become a very popular “selfie” spot. Now, we are off to see a (free!) performance at Jazz Showcase, a music club that opened in 1947. Some of the greatest names in jazz and blues have played there. We have one more day in Chicago, and then we hit the open road!